Yesterday was a day of sloth and cowardice. I had intended to cycle in the park on what was, as predicted, a sunny Sunday afternoon--but lost heart because it was just too damn cold. How cold was that? About 45 degrees F or so, with a brisk breeze. I have never biked in winter temps, even relatively mild ones, and I was actually afraid of being cold and stranded on the far side of the park, shivering. Yes, I am a wimp--a wimp in training for a Century ride. I resolved to do better today, especially after reading this item in the New York Times Metro section about the Vale of Cashmere (along with a forecast for even milder temperatures). The Vale is another of those mysterious bits of the park that I've never laid eyes on, even after repeatedly passing within yards of them. Thanks to the landscaping legerdemain of Olmsted and Vaux, Prospect Park seems far vaster than its actual size, and the undulating berms, wooded hills and valleys permit all sorts of surprises to remain tucked out of sight of the main drive and central lawns. 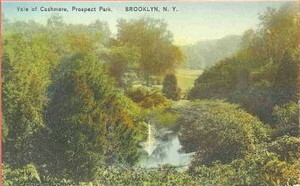 Pictures like the one above (from 1908) depict a lush formal garden sunk in a glacial kettle, allegedly a few minutes' walk north from Grand Army Plaza. However, these days the Vale has a checkered reputation. It is a magnet for birders, whose blog posts brim with wondrous sightings, and has even been the scene of at least one wedding. 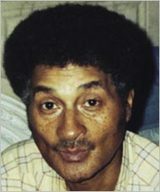 But it is also a notorious gay cruising spot, as well as the site of several apparent gay bashings and the murder, almost two years ago, of a gentle soul named William Oliver. One is warned against exploring the Vale alone. Which made me want to go there very badly. The only child of overprotective and perennially worried parents, I was nicknamed "Fragile" as a kid (until I snapped, and beat up my tormentors). Still the kid with something to prove, I've always wanted one of those bumper stickers from the old "Black Pearl" taxi service: "We're Not Yellow. We Go Anywhere." So today, with temps a bit milder, I resolved to kill two fears with one stone, and bike in the cold to the Vale. As it happened, I picked, as they said in Airplane,the wrong day to give up sniffing glue; this morning I got socked with some kind of horrible hormone-spiked brain-chemical Bad Thing, and physically I felt lumpish and weak, no trace remaining of the high of my last spin class on Saturday. The cold made my nose run, I overdressed ridiculously, and my pants flapped so I had to tuck them into my socks like an uber-dork. One thing was certain: No one would be cruising me in Cashmere. As I struggled up the hill past Nellie's Lawn, I couldn't find an obvious marked path to the Vale. Then, on the footpath, I spied an NYPD cruiser nose down a hill into a wooded copse. Aha! Follow the cops! 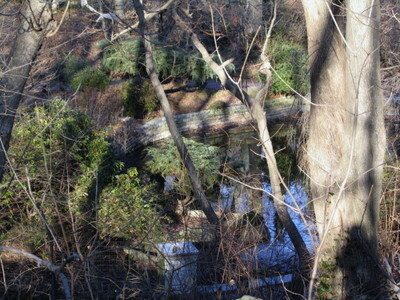 In a few yards, I was halted by a chain-link fence but beheld a magical site: a sunken garden behind a screen of bare trees, with a leaf-strewn pond glinting in the late afternoon sun. The cop car pulled off into the distance, and I got off my bike. All around me, birdsong burst forth from the treetops as if programmed by an over-eager Foley artist: woodpecker, cardinal, robin, dove, and several marvelous songs I seldom hear. One fellow in a puffy jacket walked around the stone-edged pond and out again, his purpose known only to himself. I didn't descend the wide steps leading down to the garden, but headed back to the main road; as I left, a mom pushing a toddler in a stroller passed me on the way in. I wonder how the current lists of some of our ace birders compare with this 1910 New York Times list. The real corker is at the end of the article: the discovery of a "novelty"--the European starling! Little did the German know just how much he should weep over seeing one. Figures some guy from Staten Island was responsible for letting them loose on us! Thanks for a great archive discovery! When I first moved to park Slope, the Vale was one of my favorite places to ride my bike, site, and write in my journal. Not only birds, but turtles and frogs find their way there. I've written several poems about the Park there. It's an inspiration. By bike, it's much easier to access from the lower part of THE HILL on the drive there. Just past the Zoo, over the little bridge, on the right is the Dongan Oak marker. The path that rises from the road to the left of the marker will take you to the Vale. If you reach the Battle Pass marker, you've gone too far. You can also double back and ride up out of the Vale to the entrance where you saw it, bypassing that segment of the East Drive. And the Park has long been a site of many violent hate crimes over the years. Only a fraction come to the attention of the general public.